Vice President M Venkiah Naidu presenting the award to Aizwal FC in Guwahati on Sunday. The Sports Club of the Year award was presented to Aizawl Football Club on Sunday at a function held at Srimanta Sankardev Kalakshetra in Guwahati. 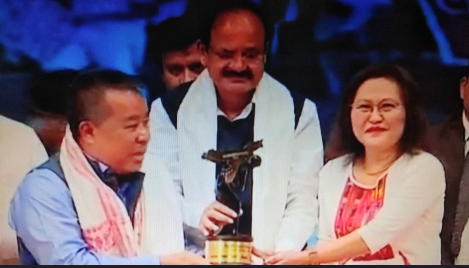 Vice President M Venkaiah Naidu gave away the award to the football club in the presence of Assam Chief Minister Sarbananda Sonowal and other dignitaries. Aizawl Football Club has come a long way to write one of the most remarkable chapters in the history of Indian football. The club in May this year humbled Shillong Lajong in a Northeast derby to claim its maiden Hero I-League title. Aizawl FC was founded in 1984 in Aizwal, the capital of Mizoram and has since participated in various amateur tournaments. In January 2012 they were officially certified by the All India Football Federation to participate in the I-League 2nd Division, the second tier of football in India. At the programme archer Pramila Daimary was also honoured. 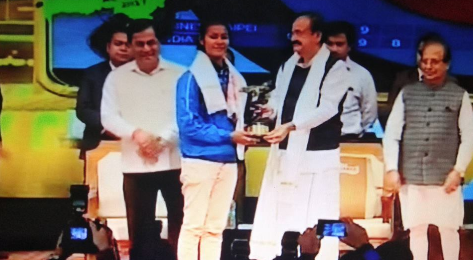 She was conferred with Sports Person of the Year award. The awards are constituted by Sadin-Pratidin group of publication.